This week’s Torah parashah, Emor, is one of insightful contrasts. 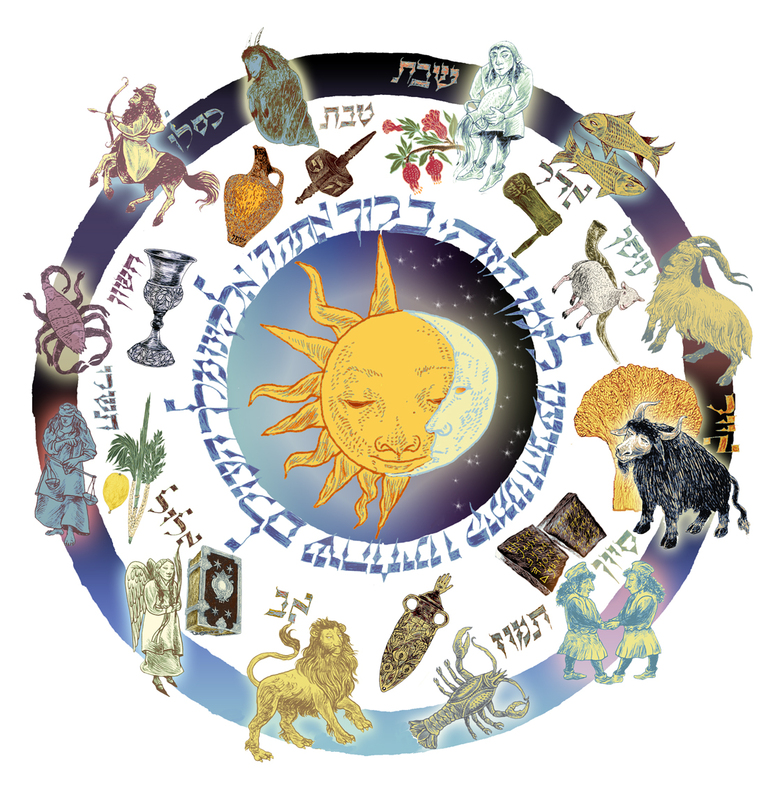 It emphasizes the observance and performance of good deeds (mitzvot) for the festivals of Passover (Sefirat ha-Omer or Counting of the Omer), Shavuot (Shtei ha-Lechem or Grain Offering), Rosh HaShanah(Yom Teruah or Blowing of the Shofar), Yom Kippur ( Yom Ta’anit or Day of Fasting), Sukkot (Chag Ha Succot or Festival of Booths). 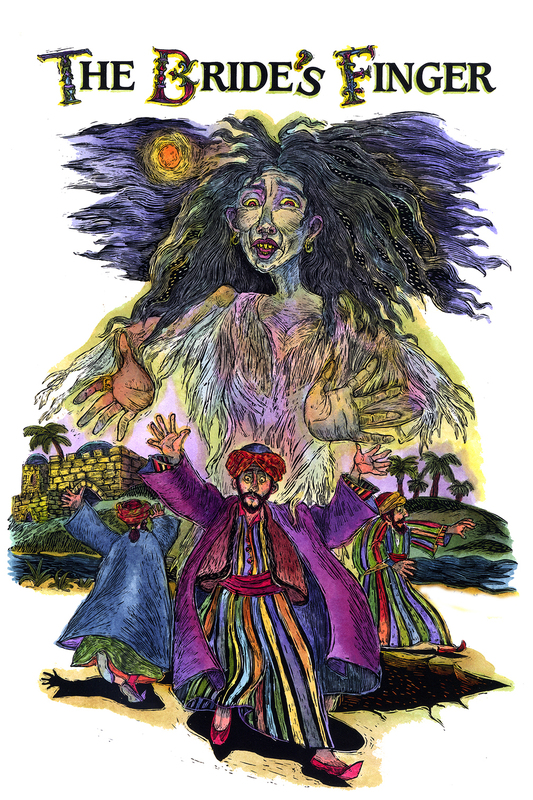 My images for this parashah focus on the Counting of the Omer which occurs during the forty-nine days between Passover and Shavuot (remembering respectively the exodus from Egypt and the receiving of the Law at Mt. Sinai). Omer is the Hebrew word for ‘sheaf’, an offering of grain brought to the Temple in hopes of a healthy barley harvest. For seven weeks, one omer is set aside (today, this is done symbolically) and counted each day. 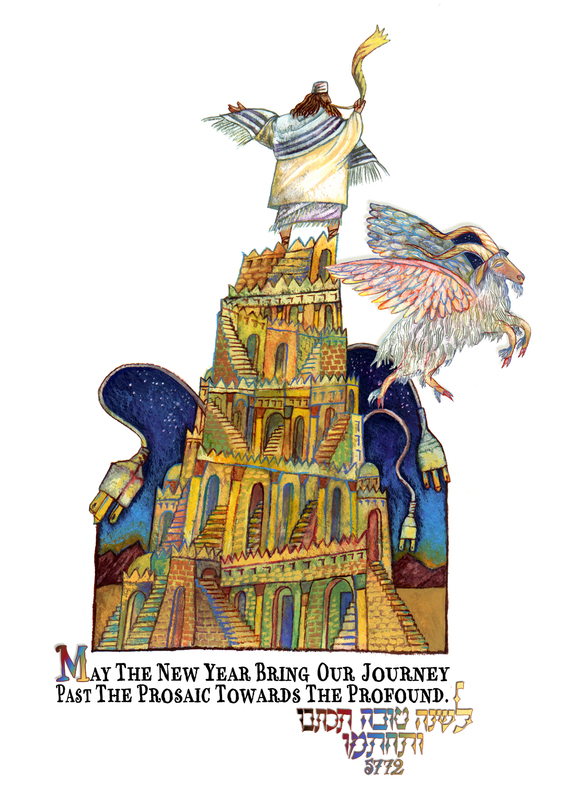 The practice commemorates the length of the Israelites journey from Egypt to Mt. Sinai. Besides these images is Shimon Bar Yohai, the revered rabbi, scholar and alleged author of the Zohar. It seemed appropriate to include him on this page because he is said to have died on the thirty-third day of the omer count. Behind him is Psalm 67, traditionally recited on Lag B’Omer. 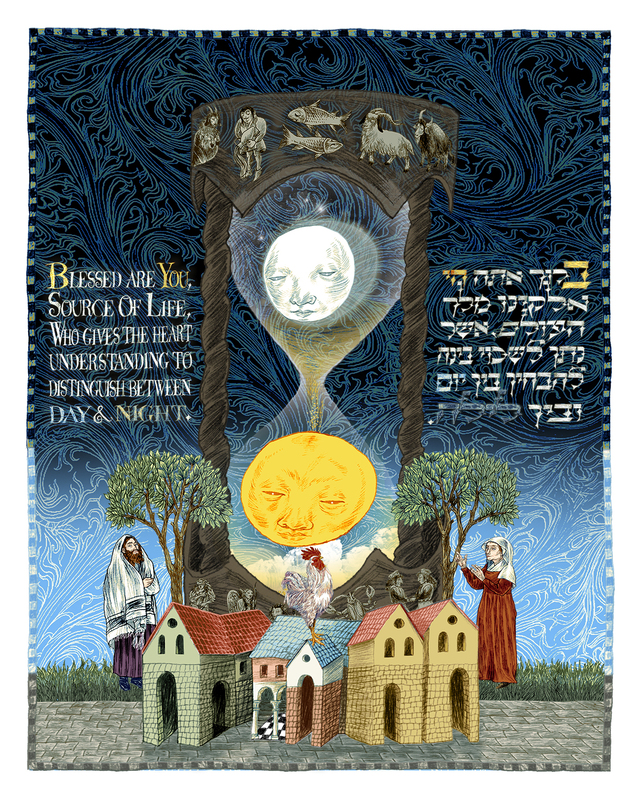 The psalm consists of seven verses with forty-nine words mirroring the count of the omer in appreciation of the earth’s bounty by all who partake of it. 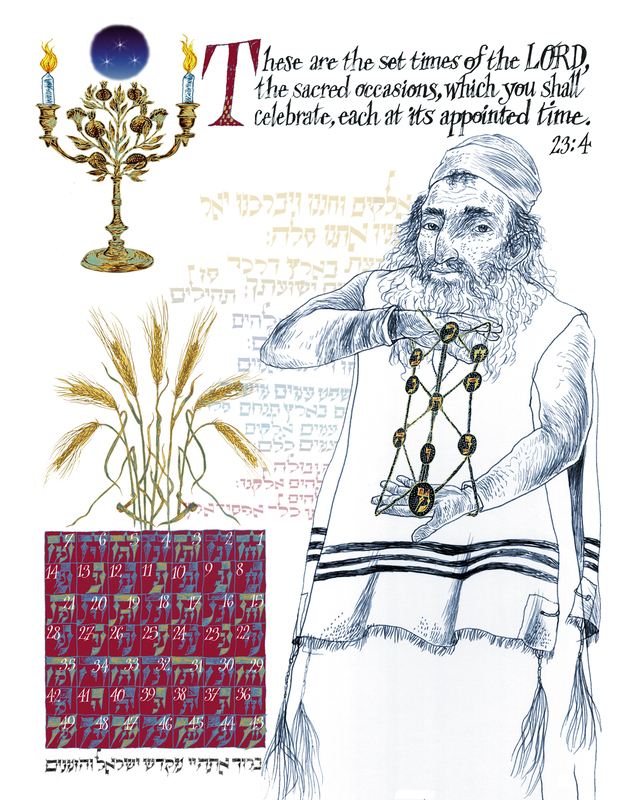 Below this page is a detail from the facing page of the spread for parashah Emor. It is called Of Stars & Seasons and is my interpretation of the ancient Hebrew zodiac, which is based on the Jewish luni-solar calendar. In this system the year corresponds to the solar calendar while the months follow the lunar calendar. Since the twelve months are about eleven days short of 365, a leap month is added to the calendar on its nineteen-year cycle. Accordingly I have merged the sun and moon and surrounded them by the holidays corresponding to the signs of the zodiac. The Shehekhianu blessing for praise and thanks to God is recited at the first candle-lighting for each festival is seen at the core of this celestial calendar.